Mariah Carey’s All I Want for Christmas is debuting on Blu-ray, DVD, Digital and On Demand on November 14. Mariah Carey’s All I Want for Christmas is You is debuting on Blu-rayTM, DVD, Digital and On Demand onNovember 14, 2017 from Universal 1440 Entertainment, a production entity of Universal Pictures Home Entertainment. Narrated and executive produced by Mariah Carey, the animated family film follows little Mariah as she chases her dream of having a puppy of her very own, making her ultimate wish for Christmas come true. Joining Mariah Carey is an extraordinarily talented, dynamic and lovable voice cast including Breanna Yde (“School of Rock,” “The Haunted Hathaways”) as little Mariah; Henry Winkler (“Happy Days,” “Royal Pains”) as Grandpa Bill; Lacey Chabert (Mean Girls, “Party of Five”) as Mariah’s mother Penelope; and Phil Morris (“Smallville,” “Seinfeld”) as Mariah’s father Bud; along with Laya Hayes (“Doc McStuffins,”Sister Code) as Mariah’s friend Vicky and Keiko Agena (“Gilmore Girls,” Transformers: Dark of the Moon) as the pet adoption facilitator Emiko. When Little Mariah (Yde) sees a darling little puppy named “Princess” at the pet store, she suddenly knows exactly what she wants for Christmas. Before her Christmas wish can come true, she must prove that she can dog-sit her uncle’s dog, Jack, a scraggly rascal; in fact, the worst dog in the county! Jack turns Mariah and her family’s perfect holiday preparations upside down in hilarious ways. It wasn’t exactly the Christmas she wished for…it was more than she ever wanted. 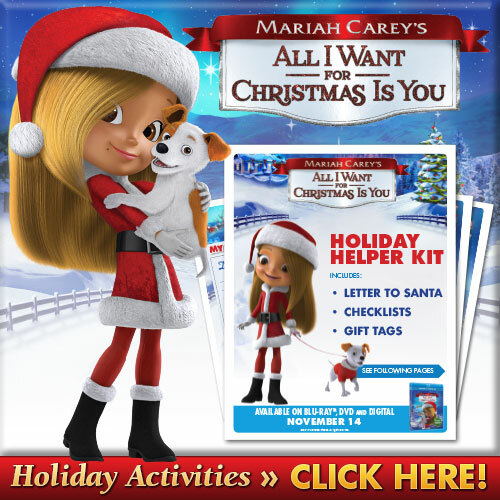 Based on the iconic Christmas song and popular illustrated book of the same name, Mariah Carey’s All I Want for Christmas is Youfeaturing Mariah’s music and narration will be a family favorite for years to come. Stella Bulochnikov for Magic Carpet Productions (A Christmas Melody, “Mariah’s World”) in partnership with producer Mike Young and Splash Entertainment (“Kulipari,” “Norm of the North”). It is directed by Guy Vasilovich (Lego Star Wars) from a script by Temple Mathews (Return To Neverland, The Little Mermaid 2: Return to the Sea). The Universal 1440 Entertainment banner develops and produces live-action and animated non-theatrical productions directly for distribution in all media worldwide. Since its formation in 2005, the group has assembled an exceptional roster of animated family fare, including the Daytime Emmy®-winning Curious George television series for PBS Kids and Hulu; as well as the latest installment of the beloved The Land Before Time film series, The Land Before Time: Journey of the Brave. The group also has successfully built upon some of Universal’s highly celebrated live-action, comedy and drama franchises, Scorpion King, Death Race, Jarhead, American Pie, Honey and Bring It On. In addition to the all-new animated family film Mariah Carey’s All I Want for Christmas is You, projects currently readying for release include the latest in the terrifying suspense saga Cult of Chucky, the newest installment of the epic sci-fi adventure hit Tremors and the next chapter of the cherished cheerleading comedy Bring it On: Worldwide #Cheersmack. I like the Letter to Santa which is what I wrote as a young kid and helped my siblings, too. Mariah Carey is such talented signer! I really love her voice. I agree she has a beautiful voice and seems like a nice person too.